Within the next couple of years, Amber Woods will become the new leader at one of the nation’s largest black-owned dealerships, as she prepares to succeed her father, Sanford L. Woods Sr., CEO of S. Woods Enterprises, (No. 15 on the BE Auto Dealers list with 2015 revenues of $177.6 million and 200 employees). The company’s Florida dealerships include Treasure Coast Toyota in Stuart, Florida, and Treasure Coast Lexus in Fort Pierce, Florida. In Michigan, it owns Lexus of Ann Arbor and Infiniti of Ann Arbor. Woods currently serves as general manager of Treasure Coast Toyota. The 34-year-old Woods is still getting acclimated as to how the dealerships operate. But truth be told, her grooming began at age 15 with her working weekends for her father at Brandon Dodge in Florida, tackling jobs ranging from service dispatcher to customer relations manager. After graduating from the University of Central Florida in 2005, she moved back to Tampa to work at Brandon Volkswagen. Black Enterprise: What made you decide to work alongside your father? Woods: I knew how hard he had worked to establish and achieve his empire, so I made a commitment to see his legacy, succession, and sustainability continue with my efforts. What key fundamentals have you learned from him? As a mathematics graduate, my father is a very methodical man. Three fundamentals I have learned from my father: (1) A great manager listens and inspects what he or she expects, (2) there are always three sides to a story in decision making, and (3) always have a seven-year plan. There are several moving parts in a business: people, product, and processes–which all have to flow in a sequence that is all tied to a goal. As of December 2015, Toyota and Lexus had 14 and 9 black-owned dealerships respectively. 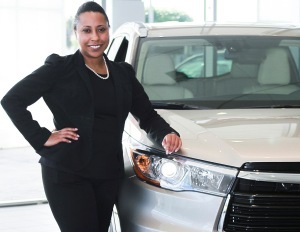 How is Toyota trying to bring in more women and African American dealers (owners/operators)? Toyota and Lexus have been extremely encouraging and supportive in my journey. TLMODA (Toyota/Lexus Minority Owners Dealer Association) also have been an excellent liaison, providing essential resources from the manufacturer and focused strategy meetings to minority dealers on a regular basis. Currently, TLMODA is completing a business succession plan for the organization that incorporates the next generation of minority dealers. In addition, my intention is to serve as an inspiration for future female dealer owners. What type of support do you and your dealership get from Toyota? Toyota and Lexus are very involved in the success and constant improvement of their dealers. Toyota provides an excellent resource support system connecting the local communities and national nonprofit organizations to the brand. They also hold regular meetings providing relative and accurate information on marketing, product updates and market analysis statistics to their dealers for constant improvement. Plus, Toyota and Lexus provide certified training for our team, both on campus and off site. Editor’s Note:Jeffrey McKinney contributed to this report.